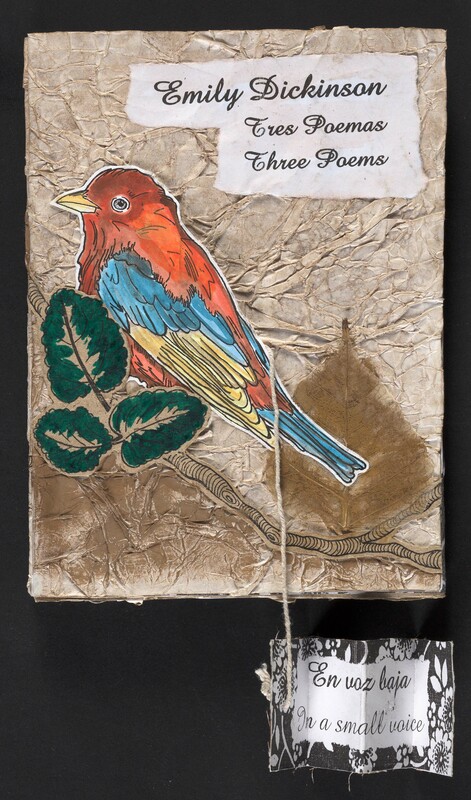 An exhibit of handcrafted books created by members of the world-renowned Ediciones Vigía, a fine press publishing house in Cuba, is on display in UConn’s Homer Babbidge Library through May 2. Since its creation in 1985 in the city of Matanzas, Ediciones Vigía has been internationally recognized as a unique artist’s collaborative press, whose work is included in outstanding private and public collections, such as the British National Library, the Museum of Modern Art (MOMA), the Library of Congress, and numerous universities throughout the world. Ediciones Vigía’s catalog combines limited editions by authors such as Baudelaire, Emily Dickinson, Pasternak, Tolstoy, Tagore, and Verlaine, Spanish-language authors such as Borges, Federico García Lorca, and Gabriela Mistral, and renowned Cuban writers such as José Martí, Lezama Lima, and Nancy Morejón. Special thanks to the Libraries’ Michael Bennett for photographing the materials in this exhibition. However, Ediciones Vigía’s work is especially notable because of their aesthetic value and original design, which use wood, paper and cloth scraps, and the most unimaginable objects and materials. This reflects both the artists’ creativity and the unfortunate economic crisis and resource shortages currently experienced by Cubans. Each handmade volume is a genuine piece of art, as well as a powerful testimony of struggle and artistic survival and sustainability. This exhibition about one of Cuba’s most innovative fine art publishing houses sheds light on this often misunderstood country, Casamayor-Cisneros observes. “While showcasing pieces of remarkable aesthetic value, the exhibition also exposes the visitors to a little known aspect of Cuba’s cultural production,” she notes. The UConn Libraries’ Archives & Special Collections currently owns 42 of these beautiful handcrafted books and looks forward to adding more work from the collective in the future, says co-curator Marisol Ramos, Latin American & Caribbean Studies, Latino Studies, Spanish & Anthropology Librarian. The exhibit is co-sponsored by the Department of Literatures, Cultures & Languages and the Puerto Rican/Latin American Cultural Center (PRLACC). Two public receptions will be held in connection with the exhibition on March 24, from 4-6 p.m. at the Puerto Rican/Latin American Cultural Center and on April 18 from 4:30 to 6 p.m. in Homer Babbidge Library. All organizing is science fiction. A world where everyone has a home, a great education, community based transformative justice, nourishing food to eat and clean water to drink, where we are in right relation to the planet, to each other, where are free to be and love ourselves as we are, to grow together? We have never seen it; its possibility remains speculative. Yet speculative fiction, perhaps particularly science fiction, offers a powerful opportunity to speculate-into-being. 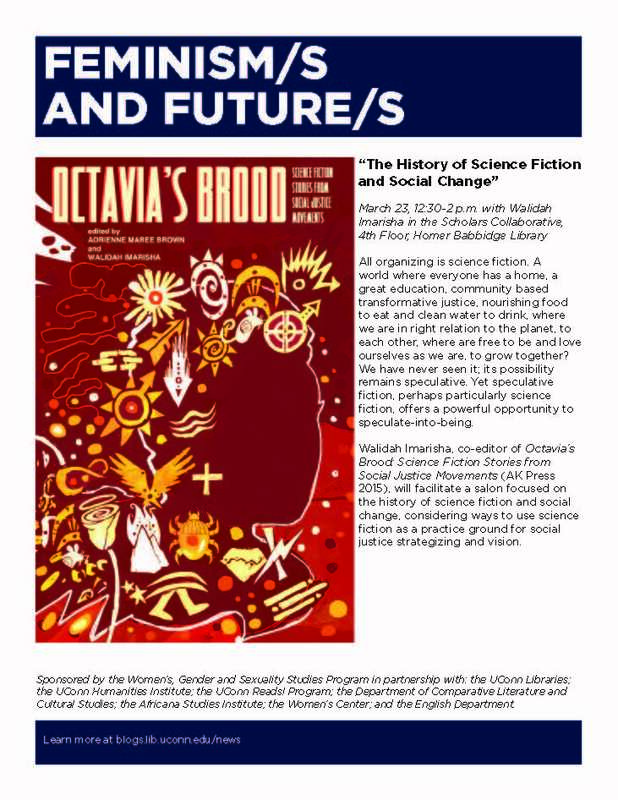 Walidah Imarisha, co-editor of Octavia’s Brood: Science Fiction Stories from Social Justice Movements (AK Press 2015), will facilitate a salon focused on the history of science fiction and social change, considering ways to use science fiction as a practice ground for social justice strategizing and vision. This is the second lecture in the Feminism/s and Future/s salons sponsored by the Women’s, Gender and Sexuality Studies Program in partnership with: the UConn Libraries; the UConn Humanities Institute; the UConn Reads! Program; the Department of Comparative Literature and Cultural Studies; the Africana Studies Institute; the Women’s Center; and the English Department.